Dr. Dimitris Metaxas is a Distinguished Professor and Chair of the Computer Science Department at Rutgers University. He is director of the Center for Computational Biomedicine, Imaging and Modeling (CBIM). From September 1992 to September 2001 he was a tenured faculty member in the Computer and Information Science Department of the University of Pennsylvania and Director of the VAST Lab. Prof. Metaxas received a Diploma in Electrical Engineering from the National Technical University of Athens Greece in 1986, an M.Sc. in Computer Science from the University of Maryland, College Park in 1988, and a Ph.D. in Computer Science from the University of Toronto in 1992. 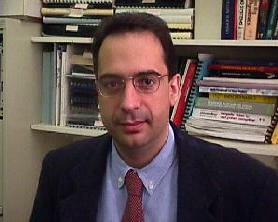 Dr. Metaxas has been conducting research towards the development of formal methods to advance medical imaging, computer vision, computer graphics, and understanding of multimodal aspects of human language. His research emphasizes the development of formal models in shape representation, deterministic and statistical object modeling and tracking, sparse learning methods for segmentation and restoration, and organ motion analysis. Dr. Metaxas has published over 500 research articles in these areas and has graduated 42 PhD students. The above research has been funded by NSF, NIH, ONR, AFOSR, DARPA, HSARPA and the ARO. Dr. Metaxas has received several best paper awards, and he has 7 patents. He was awarded a Fulbright Fellowship in 1986, is a recipient of an NSF Research Initiation and Career awards, an ONR YIP, and is a Fellow of the American Institute of Medical and Biological Engineers and a Fellow of IEEE. He has been involved with the organization of several major conferences in vision and medical image analysis, including ICCV 2007, ICCV 2011, MICCAI 2008 and CVPR 2014.